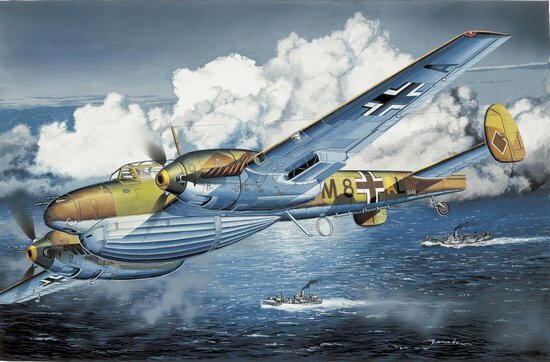 One of Germany’s famous fighters of WWII was the Messerschmitt Bf110, a twin-engine heavy fighter (Zerstörer or “destroyer” in German) that later developed into a fighter-bomber and then into the Luftwaffe’s principal night fighter. The Bf110C was the first major series-production version of this aircraft, and an effort to increase its range resulted in the Bf110D Langstrecken (“long-range”) Zerstörer. This extended-range version based on the Bf110C was fitted with external fuel tanks (e.g. 900-liter under-wing tanks or the Dackelbauch tank, the latter occasionally subject to mysterious mid-air explosions because of insufficiently vented and volatile fuel/air mixes!). The Bf110D was fielded in time to participate in the Norwegian Campaign against British and French forces in the far north of the country. Later, many aircraft were stationed in Norway so as to perform anti-shipping missions and conduct long-range raids against the north of the United Kingdom. The specific Bf110D-1/R-1, the first long-range variant, entered service in May 1940. However, its massive 1200-liter external belly Dackelbauch tank adversely affected the aircraft’s maneuverability. Dragon has released a 1/32 scale model kit of the Bf110D-1/R-1, which follows hot on the tail of the Bf110C-7 (Item No. 3203) with its impressive level of detail and metal-skinned pattern. This kit features the characteristic Dackelbauch fuel tank, which is naturally newly tooled and possesses a unique ribbed appearance. Aircraft modelers seeking a distinctive aircraft will find this variant with its huge ventral fuel tank just the answer! The fuselage has also been correctly extended at the rear. The undercarriage can be displayed retracted or deployed, while photo-etched seatbelts add a high degree of finesse to the finished product. This new aircraft model is accurate, contains an ultimate level of detail and is easy to assemble. Interestingly, the nickname Dackelbauch means “Daschund belly” so this Bf110D will certainly get modelers’ tails wagging!